The Republic of Fiji, as it is officially called, is an archipelago of more than 300 islands, with just over 100 inhabited. Located in the heart of the South Pacific, her neighbors are Vanuatu, to the west, New Caledonia, to the southwest, Samoa, to the northeast, Tuvalu, to the north, and Tonga, to the east. Interestingly, it was their neighbor Tonga that informed the James Cook expedition of the islands. It was a mispronunciation of the name Viti, which is why today the islands are called Fiji. The indigenous population has always referred to their islands as Viti, which means “east” or “sunrise” and they call themselves Kai Viti, (“the people of Viti.”) The two largest islands, called Viti Levu and Vanua Levu, are where nearly 90 percent of the population live. The International Date Line passes through Fiji, which makes it a popular destination to ring in the New Year. There is a place on Taveuni, the fourth largest island, where you can stand with one foot in the current date, and the other in a previous date. Early explorers knew Fiji to be dangerous, with her perilous reefs but even more treacherous, were the cannibals. Fijian society had several cannibalistic tribes and within the tribes several clans. A missionary, by the name of Thomas Baker, was one of the victims of cannibalism. Fijians believe that the head is sacred and touching it considered to be an act of war. This was the cause of what happened to poor Mr. Baker, after he touched the village chief’s head. Today, one of his shoes remains on display in the Fiji museum. 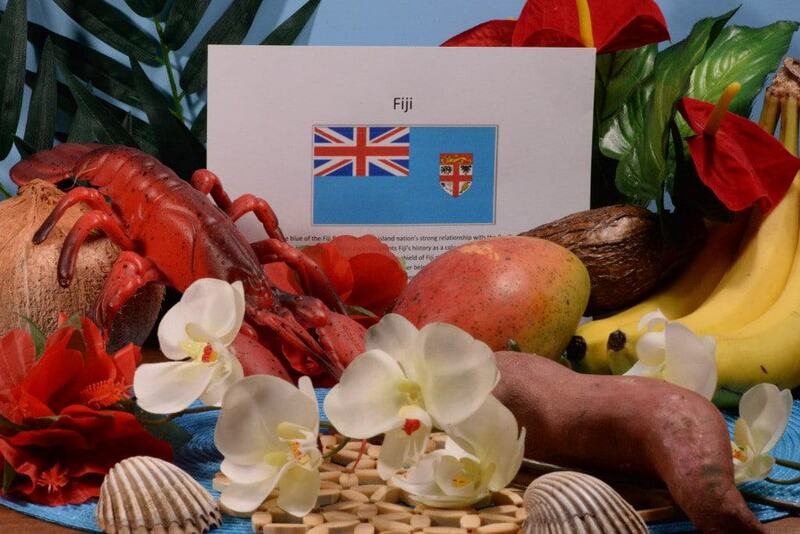 Thankfully now there is no cannibalism in Fiji, however the head is still considered sacred. In the villages, only the chief can wear a hat and sunglasses and you should never tap anyone on the head; it is considered to be extremely disrespectful. It was the British that colonized Fiji in 1874. Looking for ways to economically grow the colony, the British decided to set up large scale, sugar plantations. Labor forces were scare so they brought in an Indian work force from Calcutta to mind the fields. This would forever change the face of Fijian history. Today the population is 51 percent Fijian and 44 percent Indian. 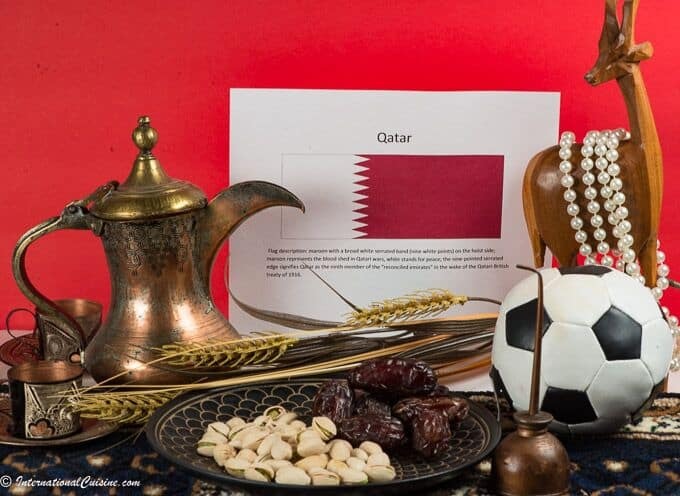 The official language is English, with Fijian and Hindustani also spoken. The chief religions are Christian, Hindu and Muslim. Fiji became Independent from England in 1970. Village life is still very much alive in Fijian culture. The ritual of offering Kava, or (yaqona) to the chief when visiting a village is still practiced today. Kava is considered to be the national drink. It is made from the dried roots of a pepper plant, called piper methysticum and it is common among Polynesian cultures. Once the roots are pounded and mixed with water it transforms into a drink with sedative and anesthetic properties. I had the opportunity to try this drink while in Fiji and well, I would say the taste is like a bitter, peppery, muddy, water. It will, however, help you sleep and may make your tongue and face a bit numb. If you are offered Kava or yaqona in Fiji, it will likely be done in a ceremonial fashion. You should dress conservatively for this event and you will be offered a seat on a mat that is placed on the ground. The chief will prepare the communal bowl of Kava. The chief, or highest ranking person, will drink first before it is shared with everyone else. Once presented, the chief will clap once before you drink and then three claps as you finish, so no sipping, drink it right down. The drinking of Kava is likely an acquired taste but the unity it brings to the community is clear; a true cultural gathering. The Fijian islands are a true, tropical paradise. The water is so crystal clear, that it changes in color from emerald green to azure blue. It has white sand beaches and is famous for its soft, coral diving. Fiji is known as the “home to happiness” and the people are incredibly friendly. “Bula,” is how you say hello in Fiji and you will hear it everywhere you go. Today, Fiji is a tourist destination with numerous resorts for every budget. My husband and I were lucky enough to visit for our 16th wedding anniversary. We stayed on Turtle Island in a beautiful “bure” (that is what they call a house) right on the beach. The thatched roof bure was spectacular. If you ever saw the movie the “Blue Lagoon,” know it was filmed there. Honestly, it is hard to come up with proper words to describe the natural beauty of this place but despite its magnificence, what we were most impressed with were the Fijian people. Their amazing hospitality made us feel a real part of their community and family. We visited their village and dined with them in incredible Fijian flair. When it was time to leave, tears filled my eyes. It was so bitter sweet to say goodbye to our new, Fijian friends and one could stay here an eternity. The cuisine in Fiji is awe-inspiring. Fresh fish and lobster are everywhere. Fiji is unique in the South Pacific with its many dishes cooked with a fusion of Indian influence, incorporating many curries and spices. Coconut milk and cream are also used often. The markets are packed with tropical fruits, citrus and tubers. Taro root, cassava, sweet potatoes and plantains are the main staples of their cuisine. Many villages have their own community gardens to provide fresh ingredients for their people. 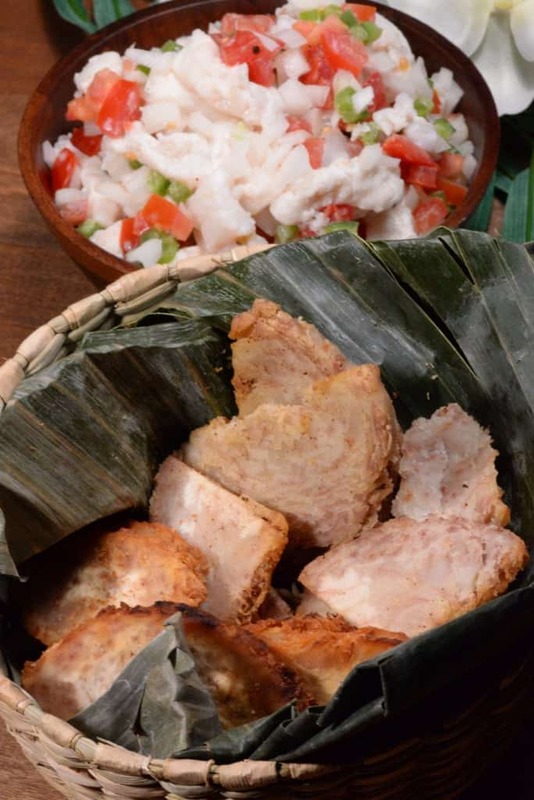 One traditional way of preparing Fijian cuisine is called Lovo. This is a feast cooked in the earth. A makeshift oven is fashioned by digging a hole into the ground and lining it with coconut husks. They are then lit on fire and covered by stones. Meat, fish and vegetables wrapped in banana or taro leaves are placed on the hot stones. This is all covered back up with dirt and left to cook for a few hours. This method of cooking imparts a unique, smoky flavor to the food. 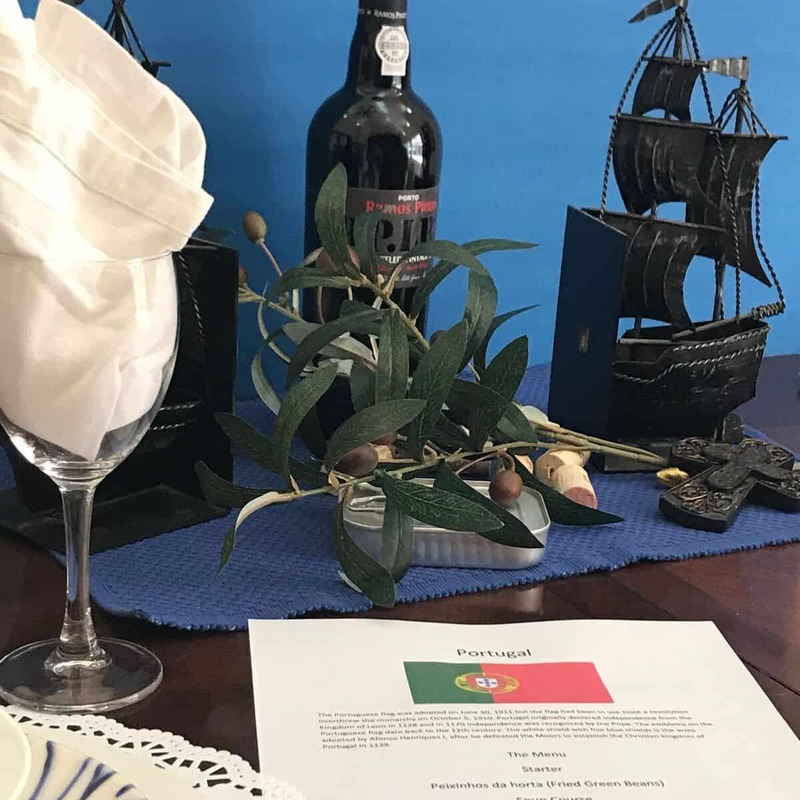 A Lovo is usually reserved for special occasions like weddings or other important celebrations. We decorated the mat with colors of the flag; a light blue representing the relationship of the Pacific Ocean to the islands. We used palm fronds and tropical fruits and flowers to set the scene. It is customary to eat on a mat on the floor in Fiji. We started by saying “Da Kana!” (Bon appetite, in Fijian.) The first course was Kokoda, pronounced (ko-konda). Fijians always use an “n” sound in front of “d.” This dish is considered to be the national dish of Fiji and can be found all over the islands. 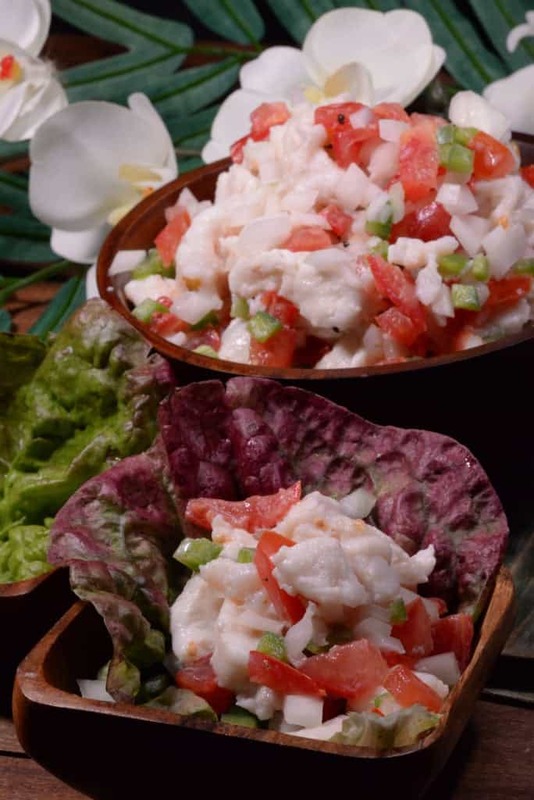 Kokoda is an outstanding fresh fish ceviche (I used mahi-mahi )made with citrus and coconut milk and served with a side of fried taro root to scoop up that wonderful fresh goodness. A perfect way to begin our Fijian feast. 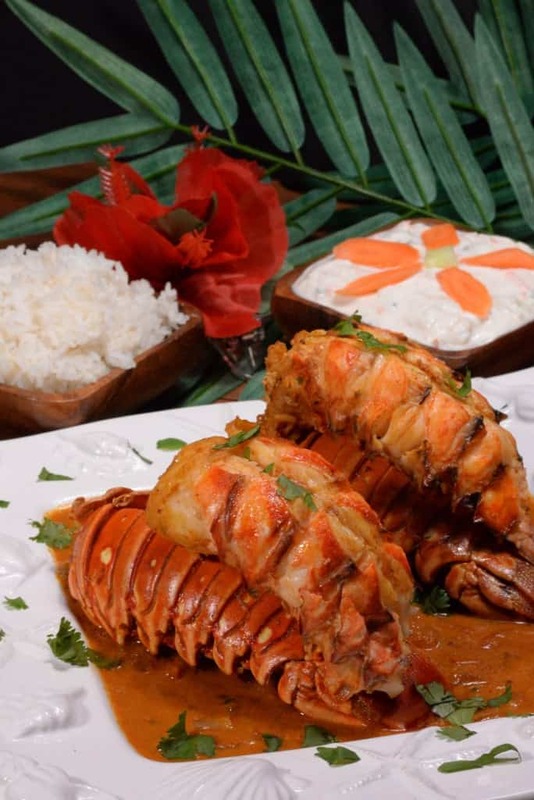 For the main course we had a lobster curry in coconut milk. This is an ideal way to experience the fusion of Indian and Fijian cuisine. The curry was perfectly spiced and the lobster was rich and succulent. 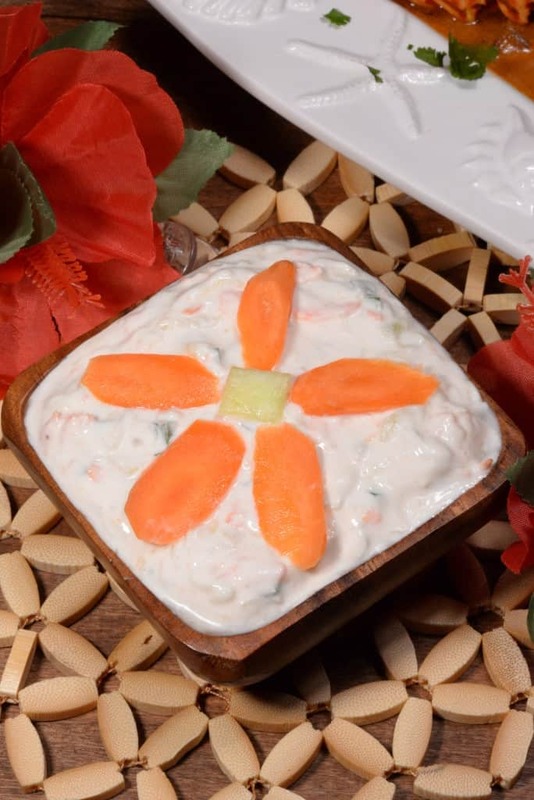 We served it with plain white rice and an amazing creamy, cucumber and carrot salad called raita. It was wonderfully soothing to the palate to contrast the spicy, lobster curry. For dessert, banana cake; this was the traditional way to end our meal. 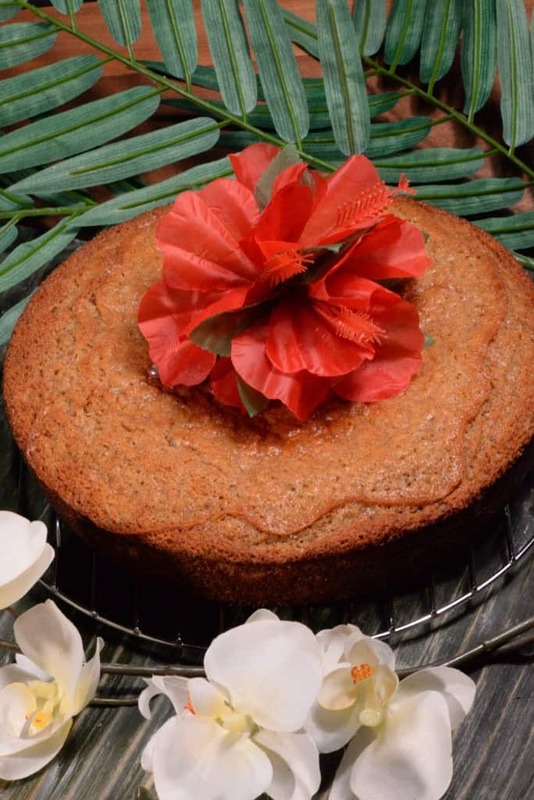 It is said there is never a Fijian party that does not have banana cake! We enjoyed our Fijian meal with what else but Fiji water. Yes it really does come from Fiji and yes, it really is delicious water.